When you think of The Grinch you probably don’t think of it in terms of Valentine’s Day. Well, we are here to show you just how wrong you are! We’ve created a brand new recipe for a Three Sizes Too Big Heart Cookie Cake! Not only that, but we also have a fun giveaway! We’re giving new meaning to what it means to be a Grinch! In The Grinch, “Academy Award® nominee Benedict Cumberbatch lends his voice to the infamous Grinch, who lives a solitary life inside a cave on Mt. Crumpet with only his loyal dog, Max, for company. With a cave rigged with inventions and contraptions for his day-to-day needs, the Grinch only sees his neighbors in Who-ville when he runs out of food. When we were asked to create a new recipe for The Grinch, we immediately went towards Christmas theming (much like our Grinch-mas Bark recipe). However, the challenge with this was that is needed to be Valentine’s Day themed since the home release is after the holiday season. 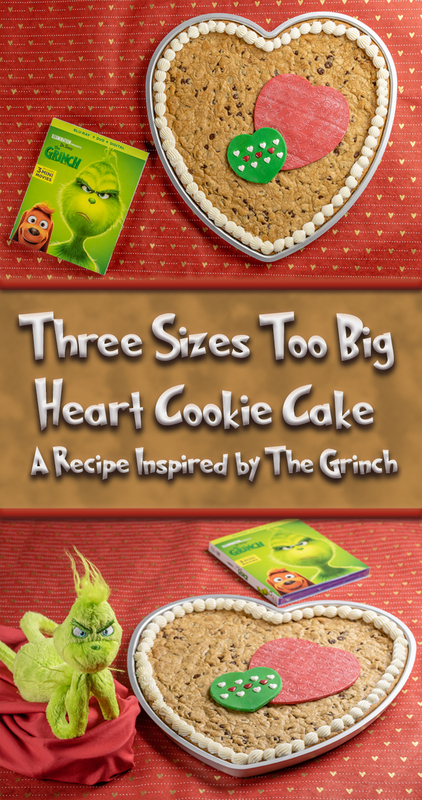 We decided to take inspiration from one the mot obvious places, the Grinch’s heart! 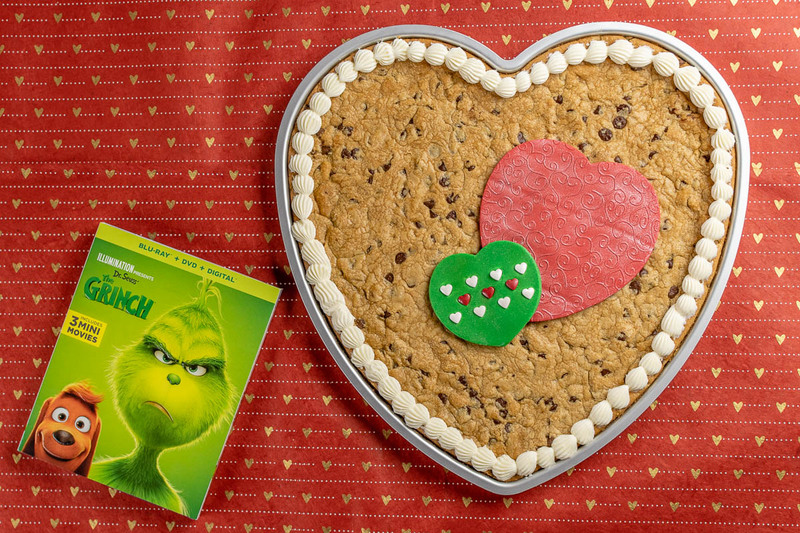 We created a large cookie cake to give the impression that his heart grew three sizes! 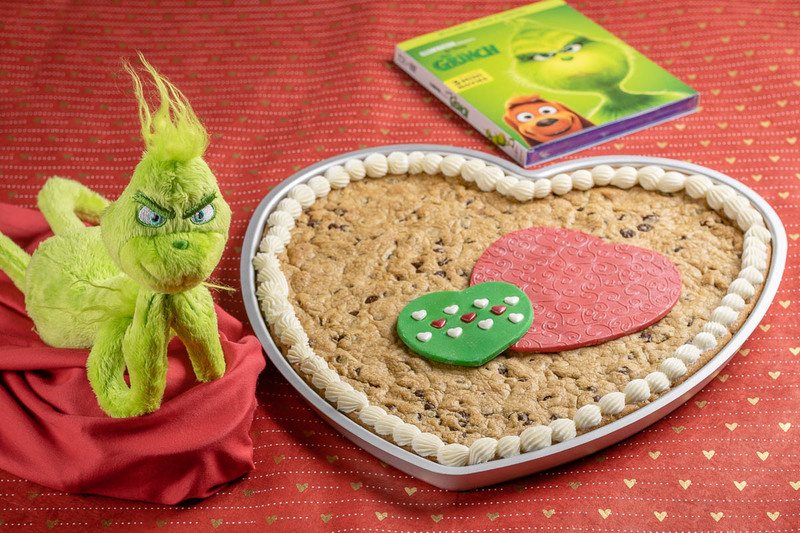 We hope you enjoy our sweet Valentine’s Day recipe inspired by The Grinch! The Grinch is available now on Digital HD and Blu-ray! Just to show you we aren’t grinchy ourselves, we are giving away 5 Blu-ray copies of The Grinch over on our Instagram! Be sure to head over there and enter! The winners will be chosen next Tuesday! Good Luck! Who says The Grinch is only for Christmas? 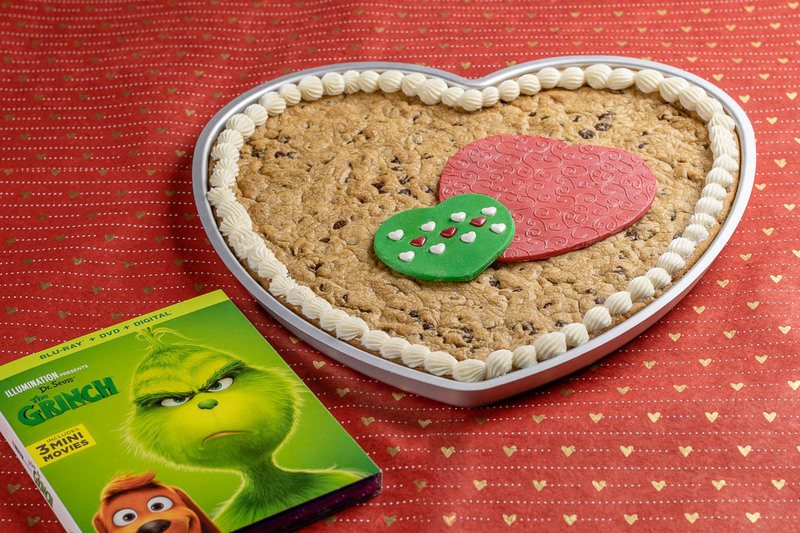 The Geeks have created an adorable heart shaped cookie cake inspired by Illumination and Universal's The Grinch! Preheat oven per cookie dough recipe instructions. Spray your cookie pan with cookie spray. Spread dough all the way to the edges of the pan. Once cooled, roll out red fondant to about 1/8”. Roll fondant roller over the red fondant. Using the larger heart cookie cutter, cut a heart. Brush with pink luster dust. Place red heart on the cookie cake. Roll out green fondant to about 1/8”. Using the smaller heart cookie cutter, cut a heart. Brush with green luster dust and decorate with heart sprinkles. Place on the red fondant heart in the opposite direction. Pipe white frosting along the outside edge. *This is a Paid Promotion for Illumination and Universal’s The Grinch. All opinions are wholly our own. Giveaway blu-ray copies of The Grinch provided by Fingerpaint Marketing. View our Disclosure Policy for more info.